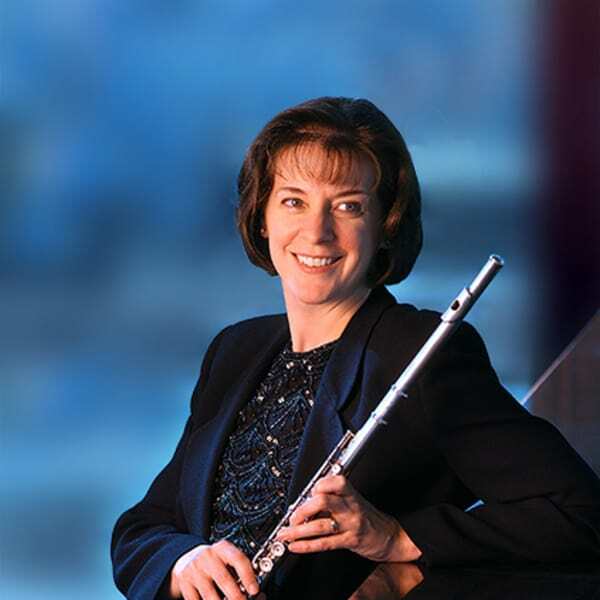 Originally from the Philadelphia area, Elizabeth Koch has been Principal Flute with the ESO since 1987. She studied at the New School of Music in Philadelphia, the Cleveland Institute of Music and the Blossom Festival School (summer home of the Cleveland Orchestra). Her teachers include David Cramer (Assistant Principal Flute, Philadelphia Orchestra), Jeffrey Khaner (Principal Flute, Philadelphia Orchestra) and Adeline Tomasone (Principal Flute, Philadelphia Opera). In the summer of 1987, Elizabeth was the only American flutist to play in the Schleswig-Holstein Musik Festival Orkester under Leonard Bernstein. Since arriving in Edmonton, Elizabeth Koch has been in demand as a soloist with the ESO, the Alberta Baroque Ensemble, ECHO and the Arden Ensemble. Elizabeth was a founding member of the woodwind trio Take 3 which was heard regularly on CBC Radio from 1992-1998. She is on faculty at King's University College and maintains a private studio. She is married to ESO violinist Murray Vaasjo. They have one son - and a number of cats.